Have you heard of a "Jinja Croquette"? It literally means a "Jinja Shrine Croquette". 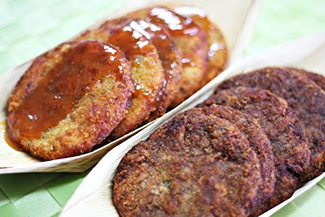 The croquettes were first made over 70 years ago in Isesaki City. Later, in the mid-1950's, a food stall started to sell croquettes next to the Isesaki Jinja Shrine. Over time, people began to call them the Jinja (shrine) Croquettes.